The official release is 19 Dec 15 through 5 Jan 16 for Cadets. The cadets/cadet candidates will normally be able to leave anytime on 19 Dec 15. That being said, you need to check with your cadet. If they take their last final on say Wednesday, then they can leave after their final with Commander's permission (standard release is given). Your cadet can go into their computer system (CAMIS) and look up each of his or her classes and see when their finals are. Cadets will not be allowed to move up finals for airline tickets. Also the return date is 5 Jan 16 by 7pm. Cadets should land in Denver not later than 3 hours prior to Academy check-in time at 7 pm. No set time for Colorado Springs, but at least an hour is suggested. Prep School Release date is 17 Nov at 9:00 am with a return 3 Jan 16. Below is the 2015 Cadet Winter Break Bus Transportation Info. These shuttles don’t normally come directly to USAFA, but to a hotel in Colorado Springs. 1. 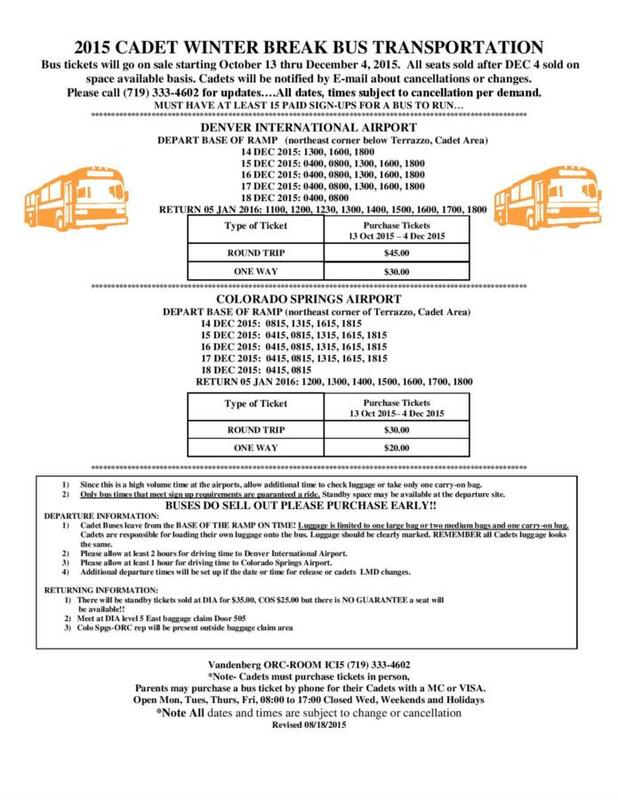 Front Range Shuttle (direct to airports): http://www.frontrangeshuttle.com/, (719) 237-2646. 4. A & B Limo Towncar: http://www.cartotheairportdenver.com/colorado-springs-to-dia/, (303) 578-4802. TAXI information for USAFA access before or after Visiting Hours: For your information the following taxis have already been approved access to the installation before or after duty hours. So your cadet can call them to get to the airport or local hotel to catch a shuttle to Denver airport during non-visiting hours. We Hope this info is helpful.